My cats friends *ss smells. 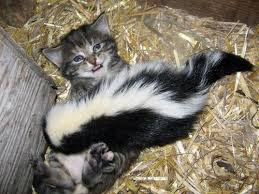 Alright fuckers, no joke… My cat has a friend who’s a skunk. The skunk is here every day in the backyard and my fat f*cker trots up to him and they play for a minute and then the skunk goes on her merry way and finishes her business of feeding herself and her very fat stomach, which I’m assuming is filled with babies to be born. Now what is wrong with my life, besides the obvious? Why is it that my cat is friends with a skunk? Why is it that my cat loved my rat? Why is it that I like the skunk, loved the rat and love the cat? Why do I take in all of these wayward animals and do animal rescue and love on all of these people’s different animals? Let’s get back to the first question- why is my cat playing with a skunk? Is the skunk going to end up coming into my motorhome looking for meals? Will that eventually turn into the skunk coming in and out as she pleases just like my cat? Am I going to end up having a semi-wild/semi-friendly skunk as a semi pet? Will somebody please marry me, put me into a locked apartment and just keep me safe from all of these animals that keep falling into my lap. Except that goat. When a goat falls into my lap I love it. I love it every time. Especially the horns.